with 28 rural okrugs under the district's jurisdiction. with 20 rural okrugs under the district's jurisdiction. with 35 rural okrugs under the district's jurisdiction. with 25 rural okrugs under the district's jurisdiction. with 27 rural okrugs under the district's jurisdiction. with 30 rural okrugs under the district's jurisdiction. ↑ Государственный комитет Российской Федерации по статистике. Комитет Российской Федерации по стандартизации, метрологии и сертификации. №ОК 019-95 1 января 1997 г. «Общероссийский классификатор объектов административно-территориального деления. Код 61», в ред. изменения №259/2014 от 12 декабря 2014 г.. (State Statistics Committee of the Russian Federation. Committee of the Russian Federation on Standardization, Metrology, and Certification. 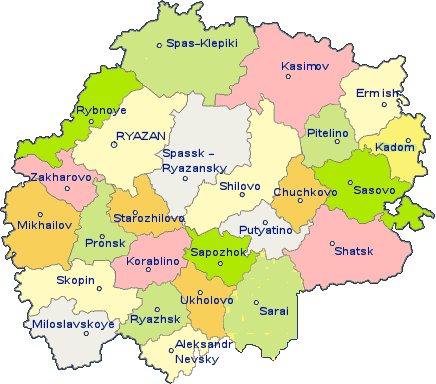 #OK 019-95 January 1, 1997 Russian Classification of Objects of Administrative Division . Code 61, as amended by the Amendment #259/2014 of December 12, 2014. ).